The post The Hard Reality Of Honolulu Rail Costs appeared first on Honolulu Civil Beat. 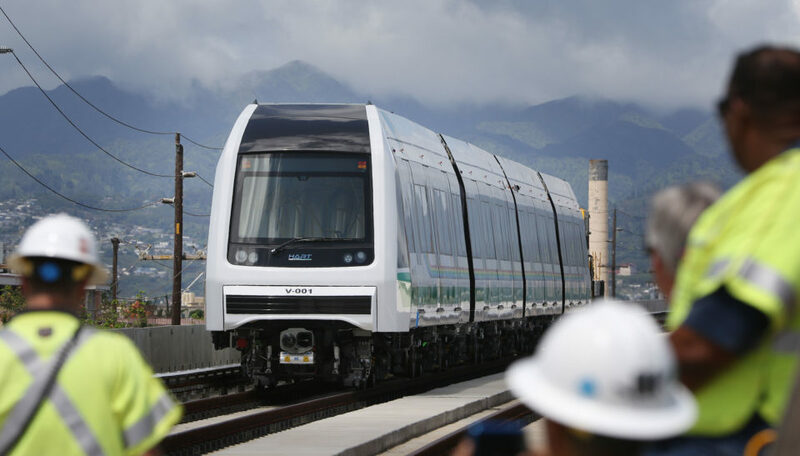 There is a very large disparity between the costs for construction and equipment for the Honolulu Authority for Rapid Transportation’s rail, and the total costs represented by HART to Hawaii’s Legislature. Ten miles of guideway have been finished at a cost of $568 million. The next 5.2 miles of guideway have been awarded at a cost of $744 million. Six stations have been awarded at a cost of $196 million. HART indicated that the rail yard has been completed for $280 million. 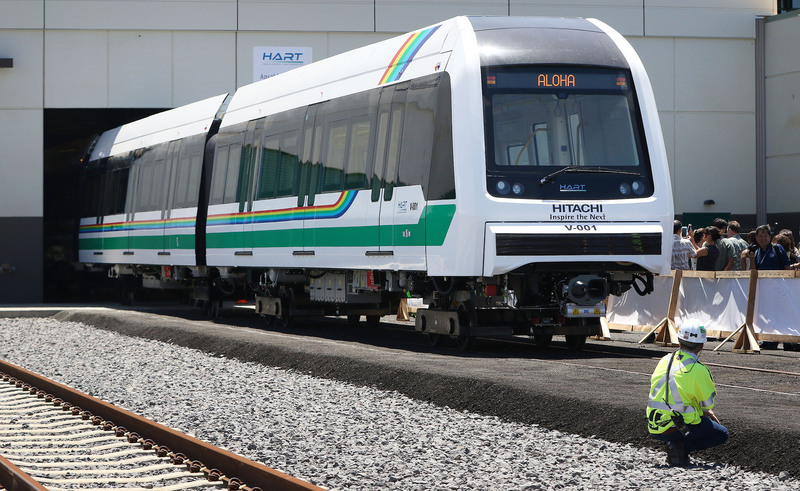 About $300 million will buy 30 rail cars from Ansaldo, now Hitachi, for service from East Kapolei to Middle Street. HART estimates that the remaining seven stations between East Kapolei and Middle Street will cost $383 million. 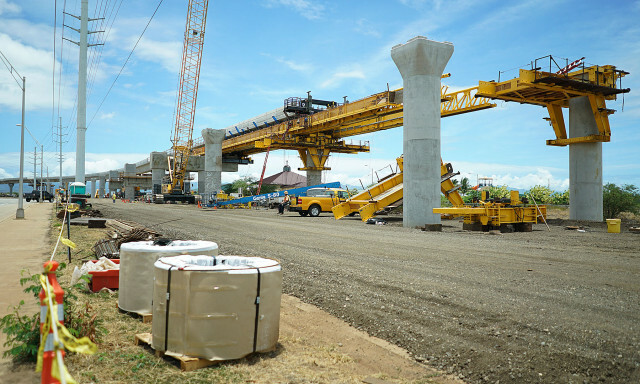 This brings the cost of rail from Kapolei to Middle Street to just under $2.5 billion for a completed rail system. Additional costs include preliminary engineering, final design and project management and construction administration. All these plus insurance, and a few other miscellaneous costs are called soft costs. A rail guideway car on Farrington Highway being tested by HART in May. Is the agency accurate in its cost estimates for the project? 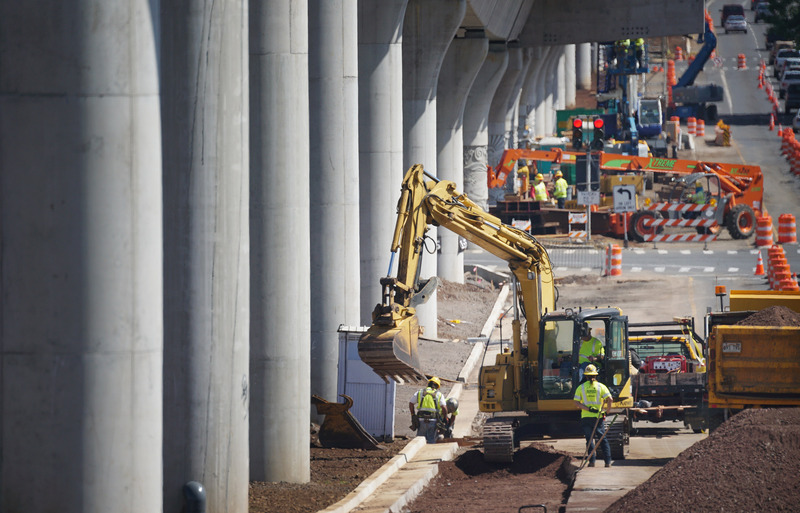 Soft costs for built transit guideway projects in the U.S. range from 11 percent to 54 percent. The recommended default for soft costs is 30 percent, but let’s take the maximum of 54 percent for the HART system. 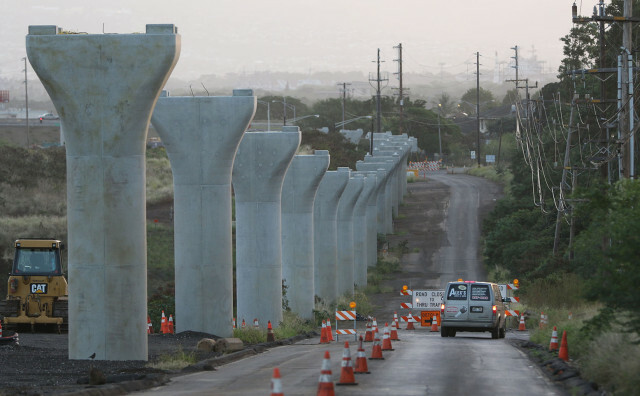 Rail from East Kapolei to Middle Street will cost $3.9 billion for construction and soft costs. Eminent domain costs (this segment involves limited land acquisition at the “Banana Patch” in Waipahu), lawsuit costs and delay losses added another $100 million. This brings the all-inclusive total cost to complete the rail system from East Kapolei to Middle Street to $4 billion! How did HART costs change from an “affordable” $4 billion system to a $10 billion-and-counting boondoggle? A. The cost for construction, utility relocation and eminent domain from Middle Street to Ala Moana Center is exorbitant. Note that these costs do not account for the cost to the local economy due the severely disrupted traffic flows between Kalihi and Ala Moana. B. There are copious amounts of waste and fraud in this project. An example of fraud may be in the form of some consultants or contractors getting paid more than once to do the same or overlapping work, billed in different contracts or other categories, or paid large amounts to perform superficial, unnecessary or completed services, some of them disguised as project promotion, community engagement, etc., and a host of other machinations that flow money into tasks and hide duplications. Absolutely no more taxes for HART. Limit the project from East Kapolei to Middle Street. Conduct elaborate, expensive, independent forensic audit, reveal waste and fraud; sum up contributions to politicians since 2004 and reveal pay-to-play and insider arrangements; involve the FBI and prosecute. Only an elaborate forensic audit can possibly explain how an all-inclusive $4 billion cost for completing 16 miles and 14 stations has ballooned to over $10 billion for 20 miles and 21 stations. The escalation is clearly out of proportion and well outside acceptable ranges for the construction and oversight of U.S. guideway systems. The post We Should Not Pay A Penny To The Federal Transit Administration appeared first on Honolulu Civil Beat. The post What Do We Do Now About The Honolulu Rail Project? appeared first on Honolulu Civil Beat. The post What To Do With The Tax Sinkhole That Is Honolulu Rail? appeared first on Honolulu Civil Beat. We are too far down the road to demolish the built portion of the Honolulu rail project and do something far better like high-occupancy toll or HOT lanes. The opportunity to address Oahu’s congestion head-on has left the island. I propose that we continue with the ongoing work but stop approval of new contracts and major change orders. We should take a detailed look at the audit, although I would not trust it as being incisive and comprehensive enough. We should hire an auditor who specializes in auditing transit agencies to tell us what’s gone wrong so far. That’s the part of looking at the past and learning from the approximately 20 percent of the completed construction and the roughly 50 percent of the route that has gone out to bid. 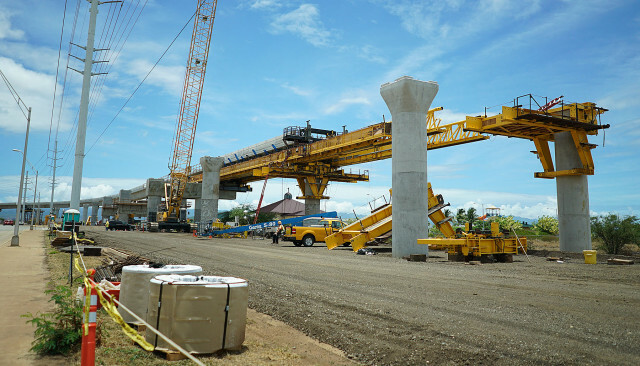 The Honolulu rail guideway takes shape earlier this year near Farrington Highway in Waipahu. One lesson learned is that right now construction costs on Oahu are too high because of a glut of projects. In order to stay within budget, rail project construction needs to slow down. This construction megaproject can be a great economic buffer in the next recession. The Honolulu Authority for Rapid Transportation (HART) should slow down now and be ready to let out more contracts at the first signs of a recession which could hit in the next couple years. The second and harder part is what to do with the second half of the route. I propose to continue the planned route all the way to Middle Street and stop there, thus completing 16 of the 20 miles. At Middle Street, rail will connect with TheBus at the Middle Street intermodal center, and we can add extra express bus circulators to downtown and Waikiki that will serve travelers just as good as the rail will. In addition we can also build the 1.5-mile Nimitz Viaduct originally proposed in 1994 and provide a ramp to/from the intermodal center. In this way, the Nimitz Viaduct will provide express bus and handivan service to downtown and Kalihi. It will also relieve congestion on the complex Keehi Interchange and reduce Airport-Waikiki peak travel times by about 25 percent. The first 16 miles of the current route have 13 stations, and the train can easily reach a cruise speed of 50 mph. The last four miles have eight stations, and the train will never exceed 40 mph. The last four miles of the rail will devastate the city and cost about $1 billion dollars each. These last four miles have a high density of stations which will slow the whole route down. The first 16 miles have 13 stations, and the train can easily reach its cruise speed of 50 mph. The last four miles have eight stations, and the train will never exceed 40 mph. As we all understand, in a pipeline, like the rail or the Zipper lane, if one vehicle travels at a low speed, all following will travel at the same low speed. As I was quoted as saying in a recent Star-Advertiser column by Richard Borreca, I’d negotiate with the Federal Transit Administration, and instead of the four miles downtown, propose adding five miles in the other direction to serve Kapolei, Honokai Hale and Ko Olina, including a 4,000 stall park-and-ride structure for Waianae coast commuters. Half of this rail extension could be done at ground level for a much lower cost per mile. This extension would be tremendously beneficial in reducing vehicles miles of travel, which is a primary objective of Oahu’s transportation plans. It will be a critical lifeline to Waianae coast commuters, who are disproportionately affected by the spikes in oil prices. This version of HART rail would be a uniformly fast commuter rail service that addresses the growing parts of Oahu, leaves the old town undisturbed and serves Aloha stadium, the airport and the intermodal center at Middle Street. It is transportation that nourishes the concept of the Second City, which is the plan for Oahu, instead of permanently tethering it to the old city. This plan would cost about $7.5 billion, not including the Nimitz Viaduct. It is doable within the current construction budget, barring a major recession, tourism downturn and the corresponding drop in GET collections. We need an open-minded mayor, governor, city council and Congressional delegation to make something out of the HART disaster that has clearly become a tax sinkhole. The post $10 Billion: The Ultimate Price Tag for Honolulu Rail? appeared first on Honolulu Civil Beat. Many people can recall Boston’s “Big Dig,” the nation’s largest infrastructure fiasco with a final price tag of about $15 billion. Surprisingly, Honolulu is building a rail system that’s expected to cost at least half the cost of the Big Dig. On a per-capita basis, this will be the nation’s largest infrastructure fiasco. What are the major causes of this project failure-in-progress? First is the local political preference for a “gravy train.” Why build a $1 billion taxpayer project such as bus rapid transit when you can build a $5 billion rail project? Rail supports located along Kualakai Parkway in Kapolei. Costs for the project continue to spiral upward. Second is local decision-making incompetence in terms of having a clue about the constructability, cost and payoff of heavy rail. Decision makers paid client-focused consultants to tell them what they wanted to hear. And third is the Federal Transit Administration’s project-approval-by-politics and vested interest in transit empire expansion. A major infrastructure project is considered a failure if it exhibits at least two out of three bad outcomes: 1) large cost overruns, 2) long project delivery delays and 3) much lower usage than forecast. Tren Urbano in San Juan, Puerto Rico, is a peer project that the Honolulu Authority for Rapid Transportation will likely match in failure to meet targets. Tren Urbano’s actual construction cost was 80 percent over the planned estimate, and its ridership has been only one quarter of what was projected. HART rail and Tren Urbano were planned by the same consultant and had the same oversight from the FTA. At the end of 2015, five miles of the HART guideway and the rail yard appeared to be complete. HART, the voter approved “independent authority” that runs the project with many of its budget strings controlled by the Honolulu City Council, claimed a 25 percent project completion, although 15 percent is a more realistic estimate given what can be seen on the ground. Several segments and columns have suffered large cracks, concrete delamination and segment misalignment, and in less than two years, the guideway construction company (Kiewit) submitted 40 work change orders and recently demanded a $20 million price adjustment. Then on Jan. 5, HART discovered an (unbelievable) annual cost escalation of 10 percent and increased the cost of current contracts by another $240 million. Yet these increases are minor compared to the total escalation of cost figures. A world authority for analysis of big infrastructure projects is Oxford University professor Bent Flyvbjerg whose “Over Budget, Over Time, Over and Over Again: Managing Major Projects” and “Megaprojects and Risk: An Anatomy of Ambition” have detailed the consistent flaws in big project development and have identified rail projects as particularly susceptible to these flaws. One of the flaws is strategic misrepresentation, or cleverly worded lying to the public and decision makers, such as HART board members and the Honolulu City Council members, none of whom have any expertise in rail. As Flyvbjerg’s research has shown, costs tend to escalate as projects go from planning to design, to initial construction and finally to completion. It’s the rule rather than the exception. However, project advocates including the FTA turned a blind eye to facts and in 2009 presented to the people of Hawaii a gem of strategic misrepresentation that simply fit the political line that the proposed 20-mile rail will cost $4.6 billion, as applicable during the 2008 rail referendum. This FTA-sponsored report contains one point of truth: There is a 10 percent chance that rail ultimately will cost about $10 billion. This is where HART construction costs are headed. One would think that only three years into construction, with only about 15 percent of the project completed and only about half of the project gone to bid, HART would be sitting comfortably on a pile of money generated by a general excise tax surcharge that has been collected since 2007 (about $140 million per year) plus $1.55 billion from the Full Funding Grant Agreement. Not so. In late 2014, HART announced a $910 million expected shortfall and lobbied the Hawaii Legislature to extend the 0.5 percent surcharge from the end of 2022 to end of 2027. A smart mayor would sue the FTA for its negligent cost data representations, which were used by city mayors to manipulate the public and City Council votes of approval. In another move of strategic misrepresentation, rail planners pretended that the rail is like an electric car that one buys and then goes home and plugs in, just as rail will “just” plug into the city grid. However, rail’s 30 megawatt to 50 megawatt power draw is a major requirement. The utility’s reaction was unpleasant for HART, which is now negotiating another expensive arrangement. The combined cost of substations, a power generation agreement and the (still in limbo) airport utility relocation tasks are likely to cost about $500 million beyond the construction cost escalation charge of $240 million, bringing the known total to $6.9 billion with none of the 21 stations constructed and the second half of the project not gone to bid. Looking at the bigger picture for Honolulu which includes a $5 billion consent decree with the EPA for secondary sewer treatment, increasing dependency on imports, including 90 percent of our food, with prices escalated by the Jones Act requirements, and the nation’s fifth worst unfunded pension liability, the future is worrisome. At best, Honolulu will experience large increases in taxes and congestion; at worst, those realities plus bankruptcy. The second half of the project includes complex construction through urban Honolulu. There are discussions to terminate the project at the Middle Street transit terminal, which is at approximately the 16th mile of the rail route. This is a welcome possibility because Honolulu would be spared heavy construction and debilitating lane and road closures that would be deleterious to general economic activity and tourism. But local leadership appears to be too weak in taking on FTA and sparing Honolulu from crippling rail construction congestion and cost. I expect that the last four miles of rail from Middle Street to Ala Moana Center will cost $1 billion each in combined construction costs and economic losses. The option of a 16-mile route should be given a serious consideration. The post Letter to the Honolulu City Council: Hoopili Doesn’t Fit appeared first on Honolulu Civil Beat. As you know from reviewing various studies, traffic conditions are rated with a Level of Service ranging from A (very good) to F (very poor.) Freeway traffic conditions between Ft. Weaver Road and Aiea are at level F on any typical weekday morning. Then comes Hoopili along with a number of other approved or planned developments for west Oahu. I want to focus your attention on the H-1 Freeway, the main lifeline between west Oahu and Honolulu, which borders the project. While Hoopili’s revised Traffic Impact Analysis Report by Austin Tsutsumi and Associates is a little opaque about the derivation of growth rates because it works things out from a 2007 start, a 2010 base, a 2023 middle stage and a 2035 ultimate stage of full development, with some multiplication, the growth of traffic from 2010 to 2035 will be +43 percent. This is for Hoopili plus all other scheduled development and growth in west Oahu. This is a staggering increase of traffic for a freeway that already operates at level F.
rail HART supports Kahi Mohala approach. However, the list of recommendations in the report talks about a lane addition at the critical H-1/H-2 merge. So traffic lane capacity will improve from today’s 5 regular plus 1 (zipper) lanes, to 6 regular plus 1 (zipper) lanes. This will produce a capacity gain of +17 percent which is far too small for the +43 percent growth in traffic. Due to the piers of overhead bridges and other obstructions, there is no possibility of adding any more lanes. Recall that due to these restrictions, my solution to congestion was reversible lanes from the H-1/H-2 merge to downtown because this part of Oahu desperately needs more lane capacity. So rail, at best, will reduce the +43 percent of traffic growth to +39 percent which cannot be accommodated by the +17 percent increase of traffic capacity. So if today’s traffic is bad, then in 2035 with Hoopili and the rest of the planned developments, traffic will be severely congested. You appear to be deliberately approving transportation and development projects that will yield a grossly substandard quality of life for all of west Oahu. Yet the truth has been out there since 2008 and the City Council has deliberately ignored it. See the 2008 version (Sean Hao’s article in the Honolulu Advertiser) which says that rail won’t do anything for traffic (Appendix A). See the 2014 version (TIAR for D.R. Horton’s Hoopili proposal) that says that rail won’t do much for Hoopili and all the rest of the planned development in west Oahu. The TIAR says that the city and the state will need to add all the lanes that can possibly be added … with or without the rail. Rail’s traffic reduction is negligible. And traffic even with the added lanes will be terrible because the improvement on the H-1 freeway will be marginal and there is no parallel arterial to help the situation. 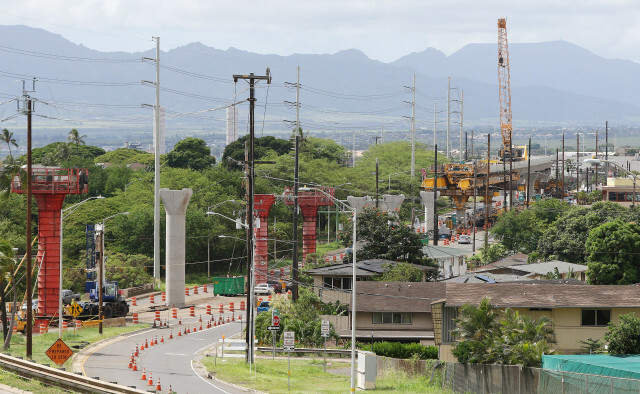 If anything, the rail project will reduce the number of lanes on Kamehameha Highway in Pearl City and Aiea. It baffles me beyond belief that you are serially approving future development and transportation projects that are certifiably calamitous for our island community. The City’s consultant estimates that in 2030 rail will reduce traffic from 18,049 to 17,209 vehicles a reduction of about 4%. This is of course a “pro-rail” estimate and the reality will be about half those rosy estimates. Recall that Tren Urbano in San Juan, PR is the best example to compare with Honolulu’s rail. It is fully elevated, in an island city, designed by Parsons Brinkerhoff and overseen by FTA. Identical to ours. They projected 100,000 daily riders. It opened in 2006 with 25,000 or so riders. Almost ten years later it barely serves 40,000 daily riders. Mind you people in San Juan make less than half the income and have less than 1/3 the vehicles of the average Honolulu resident. Tren Urbano had an approximate 100% cost overrun. Hawaii’s public employee pensions, EUTF, sewer consent decree and rail liabilities are comparable to Puerto Rico’s on a per capita basis! The post What Can We Do About the Rail? Nothing. Tackle Traffic Congestion! appeared first on Honolulu Civil Beat. Various groups are energized and urge me and each other to do something about stopping Honolulu’s rail project. The recent commotion has been brought about by (1) the large delays; the project is roughly three years behind schedule because the city did a poor job with the archaeological inventory and then deliberately delayed and obstructed the two lawsuits; (2) the revelations last December that the project is already about $900 million over budget, and (3) the City Ethics Commission’s investigation on the non-disclosure of rail project related gifts to five City Council Members, which could potentially reverse some important pro-rail votes and approvals. So what can be done about stopping the rail project now? Nothing, other than holding HART and the City accountable for project expenditures. Unfortunately this is easier said than done given that between FY 2008 and FY 2012 more than $550 million was spent and hardly any project was laid on the ground! Other agencies on the mainland can complete a 10-mile multi-lane freeway including all planning, design and clearances for this sum of money. But for $550 million we got TV and newspaper ads, building and office rentals, salaries, traveling expenses for planners and officials, piles of photocopying and plain and three-hole paper, laptop and desktop computers, cellphone and courier bills, and magazine subscriptions. And a lot more traffic congestion since 2006 when the rail project started. What’s the bottom line on traffic congestion on Oahu? 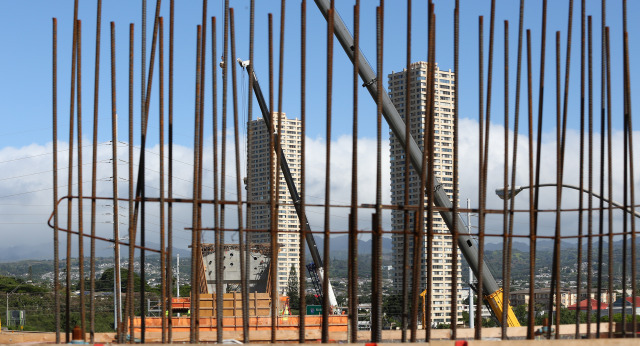 Rebar frames the Honolulu rail project’s concrete pier foundations located near the H1 and H2 freeway merges fronting Leeward Community College. Honolulu has among the worst traffic flow conditions in the nation because it is grossly lane-deficient, that is, Honolulu has too few lane miles for its population and travel patterns. Honolulu rail will never provide any congestion relief for the traveling public. By the time some usable portion of the project is done, say, Kapolei to Pearl City, its (tiny) traffic reduction will be already surpassed by traffic growth given the tens of thousands of planned new homes west of Aloha Stadium. Starting this year, there will be extensive lane closures to build the guideway and the street-spanning stations. HART can’t build 21 roughly football-field-sized concrete stations 30 feet in the air and leave lanes open to traffic under it during construction. In a typical scenario, half of Farrington Highway, Kamehameha Highway and Dillingham Boulevard will have to be closed for many months at a time. Next year the project may be in the vicinity of Pearl Harbor and Aloha Stadium. As a result, word will get out in the tourist market that Oahu is one huge traffic and construction mess. Assuming that construction progresses normally, around year 2017, construction by the airport will have major impacts on the access and land-side operations at the Honolulu International Airport. This will be quite annoying to frequent interisland travelers and on occasion it may result in missed flights. Around year 2020, several street blocks in downtown and Kakaako will be closed for months at a time. 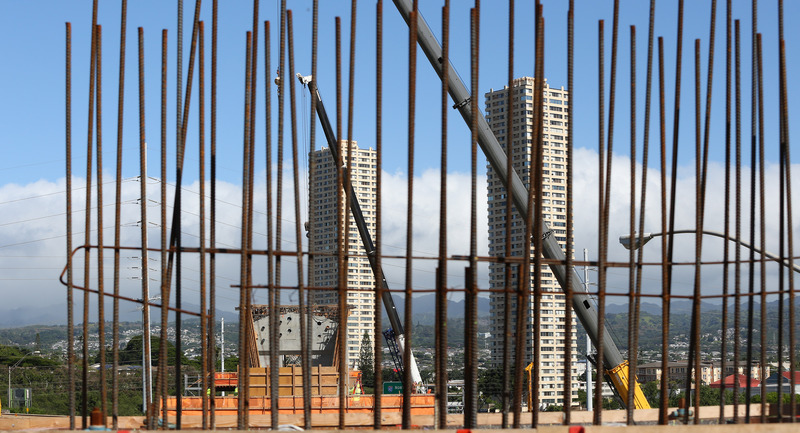 A long, dissecting portion of Kakaako will be an active construction site. Neither shop owners nor patrons can be allowed in a construction site. Mauka-makai movements between Chinatown and Ala Moana will be critically affected. Kakaako’s revitalization will be heavily impacted. Despite all this, given Hawaii’s political and decision-making reality, at this time there is no point to “fight the rail.” But there is a clear need to fight for traffic congestion solutions. This is what Oahu needed to begin with. What can be done about congestion? First, let’s not forget that the Hawaii State Department of Transportation added a lane on each side of the central part of the H-1 Freeway in 2014. This has helped a lot! Also, the DOT is adding a lane on each side of the Pearl City viaduct on the H-1 Freeway. It’ll help somewhat, but this one lane per direction addition is not enough for the current, let alone future levels of demand to/from west Oahu. There are also some plans to add a lane at the H-1/H-2 merge. This lane addition, if implemented, will be “too little too late” but will provide some congestion relief. The long queues and long periods of stop-and-go congestion will get a little shorter. Slideshow of sample solutions and initiatives. Descriptions of short and long term solutions. How can Oahu get congestion relief? Get a grip with reality and stop believing that rail will reduce traffic congestion on Oahu at any time in the future. Aggressively install lane additions, contraflow lanes, bypass lanes and bus-on-shoulder operations before the impacts of rail construction choke West Oahu’s mobility. Realize that Saudis and fracking will keep the cost of fossil fuels at moderate levels, and Congress won’t tax transportation fuels in a substantial way. Economic brakes to driving won’t apply for several more years. Thus traffic will grow and so will congestion. Promote effective solutions for traffic congestion relief through the government channels. Additions of new traffic lanes should be a priority. Create a non-governmental Oahu Mobility Group. Currently businesses and business organizations are asleep at the wheel when it comes to traffic congestion, which costs them dearly, while government is relying on silly projections of congestion relief with public transit, smart growth, transit-oriented developments and complete streets. The government is working on improvements for the 10 percent of the travelers with “alternative transportation and life styles.” It largely ignores the 90 percent of the travelers that use cars, carpools, mopeds, motorcycles and buses on congested streets. A strong voice is needed to set transportation priorities right. Once again, what can be done about Honolulu’s rail project? I think that in a few years there will be substantial appetite to terminate the rail at the airport or at the Iwilei end of Dillingham Boulevard and to continue the rail’s original Ala Moana, Waikiki and University routes with bus circulators on priority lanes. The powers that be may adopt this as a win-win compromise if the effect of rail construction is too much for locals, and for tourism arrivals and operations. Or if the electorate (finally) gets mad at them. The post Surprising Downward Trends appeared first on Honolulu Civil Beat. What do golf, convertible cars, crime, American journalists and infant mortality have in common? They are all trending downward. Let’s start with golf and cars and then move to business and people-related downtrends. The game of golf lost 1.1 million players in 2013, BusinessWeek reported. The sport has lost about 24 percent of its players between 2004 and 2013. 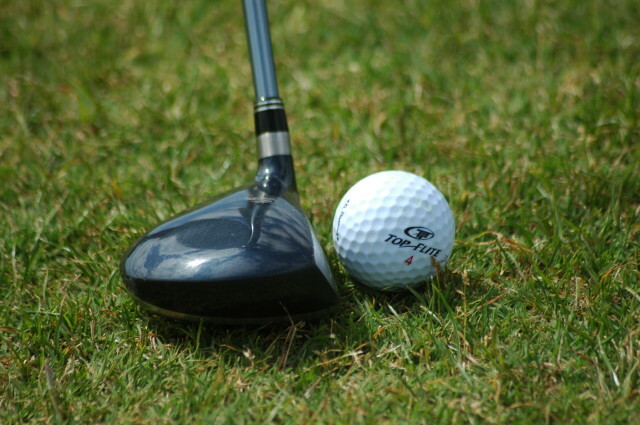 TaylorMade suffered a 34 percent drop in sales in a recent quarterly report. Only 14 new courses were built but 160 were shut down in 2013. The decline is staggering. The great recession had something to do with it, and Tiger Wood’s personal life revelations played a role as well. PGA may change the standard cup from 4.25 inches to 15 inches and adopt a 15-hole alternative standard to make the game both easier and quicker. The production of convertible cars also has seen a major decline from over 800,000 units in the early 2000s to below 500,000 in the early 2010s. Due to soft sales, manufacturers have limited their convertibles to upscale models leaving only few affordable convertible cars in the market. Edmund’s lists more than 60 convertible cars available in the U.S. market but only ten cost under $30,000. Japanese luxury cars are trending down relative to their German counterparts. In 2005 the worldwide sales of Audi, BMW and Mercedes were approximately 3 million cars combined. At the same time, the combined sales of Acura, Infinity and Lexus were approximately 1.5 million cars. Fast forward to 2013 and the same German manufacturers exceeded 5 million sold cars while the Japanese luxury brand sales were flat at about 1.5 million. Government policies can create major up or down trends. Take the case of German policy framed in 2011 after Japan’s Fukushima nuclear power plant disaster to decommission its nuclear power plants. The stocks of German energy giants E.ON and RWE lost 50 percent of their value, while at the same time the German stock market (DAX 30) had a 30 percent increase. On the other hand, the United Nation’s Millennium Development Goals adopted in 2000 may be partly responsible for a substantial drop in infant mortality in the developing world from over 12 percent mortality rate in 1990 to about 6 percent in 2013 as reported in the “Seven Million Lives Saved” by the Brookings Institution. The racial mix of the U.S. has been changing constantly but in the last 200 years whites have been dominant. Public school enrollment data suggests that this dominance is about to end. In 2000 enrollment in U.S. public schools was 59 percent white, 18 percent black, 18 percent Hispanic and 5 percent Asian, Pacific Islander and other. The 2020 enrollment forecast by U.S. DOE is expected to be 46 percent white, 15 percent black, 29 percent Hispanic and 10 percentAsian, Pacific Islander and other. The end of the white majority in the U.S. is a condition present in Hawaii for decades; a lesson from which is: There is no reason for alarm. A welcome downtrend is the substantial decline of crime in the seven most industrialized countries in the world (G7.) Since 1995 robberies are down 20 percent, homicides are down 30 percent and vehicle theft is down 55 percent. One reason for these trends is smart and cheap electronics. Smart electronics protect homes and immobilize cars. Cheap household electronic devices have removed the incentive of theft. Another big reason is the end of the crack cocaine epidemic of the 1990s in the U.S., which unfortunately is still lingering in Hawaii. Finally a positive but likely temporary downtrend is the 10 percent drop of the price of oil this year. Not only it makes local transportation and flights more affordable for Hawaii but also it reduces the cost of electric power, the production of which is over 75 percent dependent on oil. The University of Hawaii professor says what Honolulu needs right now is a straight-talking engineer. The post Why I Would Make the Best Mayor – Panos Prevedouros appeared first on Honolulu Civil Beat. What kind of mayor do you believe Honolulu needs right now? If you believe the city is in good shape and you want more of the same, then the status quo candidates are your choice. If you believe it is fiscally responsible to spend $6 billion to reduce traffic by 1%, and if you believe it is fiscally responsible for a rail project to cost us over $800,000 per car it removes from the road, then Mr. Carlisle who wants to build rail all around the island is your choice. If you want a mayor who lives in a $1,800,000 home and pays $200 per year in property taxes, and ran a “gravy train” campaign then Mr. Caldwell is your choice of self-serving politician. If however you believe that what Honolulu needs right now is a straight talking Engineer, I am your mayor. If you believe we need to fix our leaking sewers and to repair our water mains which break every day, I am your mayor. If you believe that the engineer who wrote the book on transportation can reduce traffic congestion at a price we can afford, I am your mayor. My vision for Oahu in the next 50 years is a sustainable community of no more than one million people. An island that, if correctly designed, will have enough water, enough transportation and enough energy to support its people and its visitors. Our island does not need landmarks like the Empire State Building or the Golden Gate Bridge. Our island itself is an iconic natural landmark. Our man-made infrastructure must live up to natural beauty that is Oahu’s aina. The next 10 years provide us with a golden opportunity to set the foundation for Oahu’s next 50 to 100 years. It is an opportunity to fix water, sewer and road infrastructure, one region at a time, one pass at a time, for good. It is an opportunity to involve innovative contracting and financing so that the projects are delivered on time and on budget. We can’t afford business as usual. New and rehabilitated sewers, sewage treatment, water mains and roads alone come up to about 15 billion dollars. If we do them the right way then we’ll form a healthy foundation for vibrant civic life and a robust economy. If we do them the wrong way, then the cost may double and sink Oahu in red ink, resulting in partly finished projects and endless lane closures. While the basic infrastructure is modernized we must begin to deploy traffic congestion, trash management, energy solutions and hurricane resilience measures. Electric cars, High Occupancy Toll (HOT) lanes, reuse of recyclables and trash exportation, and fossil-free energy are in Oahu’s future. No elevated trains should be allowed to permanently scar Oahu, although the possibility of revitalizing the Oahu Rail Line for light rail service from Waianae to the Airport should be explored. Oahu needs to be well equipped and well prepared to withstand a hurricane. Regional survival plans (e.g., resiliency plans for Kaneohe, Kaimuki and Kapolei), second access to Waianae, “plugs” so that Navy submarines can provide electric power to multiple areas of Oahu, and partial undergrounding of utilities and tree growth management along critical arterial streets is needed, along with routine channel and stream maintenance. If your next Mayor does it right in the next 10 years, then the chances for sustainable prosperity are great. I am the only candidate with the skill set to fix Oahu’s infrastructure. If you believe that the city needs the skills of an engineer and not of an attorney, I am your mayor.